Dobrindt criticised the Commission’s infringement procedure against the German road tolls, expected to be introduced in 2017. “I’ll tell Ms Bulc that her vision for an EU toll system, that clearly serves to burden German car drivers more, could break the German system. I have no support whatsoever for that proposal,” Dobrindt said of EU Transport Commissioner Violeta Bulc’s recent comments about the controversial tolls. Dobrindt, a member of Bavaria’s conservative Christian Social Union party, currently in the spotlight for its opposition to Angela Merkel’s immigration policies, pushed for road tolls that charge all vehicles when they drive on German roads – but then reimburse only vehicles registered in Germany. Bulc has called for a new, voluntary EU-wide toll system. On 10 December, the Commission sent the German transport ministry a request for more details about its road tolls to determine whether the new law discriminates against drivers from outside Germany. Germany has until 10 February to respond. “We expect that there won’t be any more delays from the Commission for the German infrastructure levy,” Dobrindt said, using the euphemism he coined for the tolls. “We know the German infrastructure levy is compliant with EU law. If the European Commission has doubts about that, then the decision has to be taken by the European Court of Justice and the decision should be made fast without any further delay,” he added. Consumer organisations have blasted the new road tolls. “We welcome the Commission’s investigation into whether the German toll conforms to EU principles. As a road user organisation, we believe that a system that fully exempts its own citizens from paying, while imposing the tax only on foreign nationals is discriminatory,” said Jacob Bangsgaard, director general of the Federation Internationale de l’Automobile’s operations in Europe. 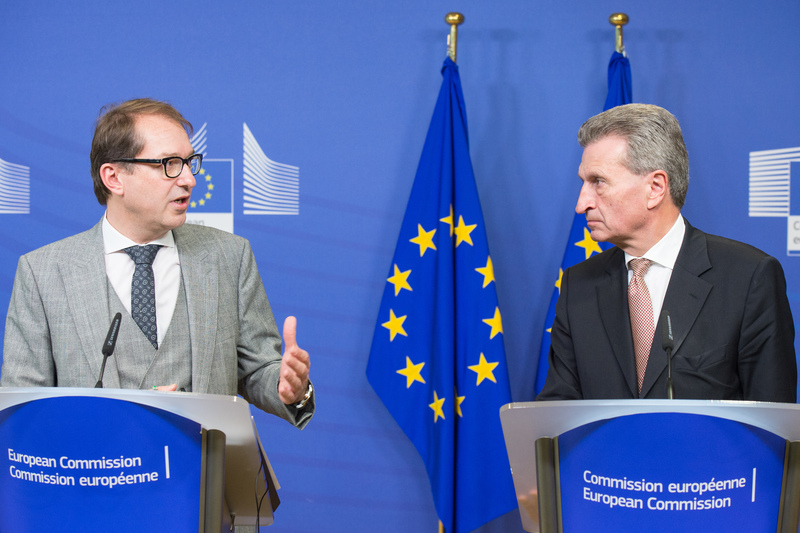 Dobrindt was asked about the tolls during a joint press conference with EU Digital Commissioner Günther Oettinger about investment in digital infrastructure, which is also managed by the German transport ministry. Dobrindt appeared eager to highlight his relationship with the German EU commissioner amid his months-long clash with Commissioner Bulc. “It’s important for us that the topic of digitalisation on the European level has one voice and the voice of Günther Oettinger,” Dobrindt said at one point. Oettinger responded cautiously but weighed in against the Commission delaying his country’s road toll. “I think delays aren’t planned and would also be wrong. We can finish and decide on the issue thoroughly but quickly,” Oettinger said. Dobrindt and Oettinger met for two hours with representatives from the German industry group Netzallianz, made up of telecoms companies and broadband associations. Dobrindt said the group discussed the EU telecoms review, the inquiry into online platforms and Google’s forays into the automobile industry. “We’re all convinced that we need to take up this competition with other world regions like the United States and Asian markets. Our investment initiatives are the basis that will enable us to do that,” Dobrindt said, referring to Google. Google has been developing and testing autonomous cars in the US. There are currently no EU rules allowing autonomous cars to drive on public roads. In autumn 2015, the German government published its strategy for developing autonomous vehicles. Dobrindt said yesterday that telecoms companies invested eight billion euros in Germany’s broadband infrastructure last year and plan to invest the same amount in 2016. The German government has set aside €2.7 billion for broadband infrastructure over the next year. In December 2015, the Commission requested more information from the German government about the law. Germany has until 10 February 2016 to respond. Minister Dobrindt has criticised the Commission for delaying the law, now set to go into effect in 2017. He maintains that the tolls are compliant with EU law. Germany can discriminate against people from other countries Bur Great Britain can’t is typical German arrogance. I think that the point of view of Germany is defendable, but only up to a certain extent. I think that the amount reimbursed to German taxpayers should be counted, and that as of the moment that the reimbursed amount exceeds the historical infrastructure investments done in the roads, that then German taxpayers should pay the same amount.